Most live concert visuals are created digitally, but I made mine by pointing a camera at a small-scale puppetry setup, then connecting that camera to a projector. This gave my visuals a unique kind of tangibility. 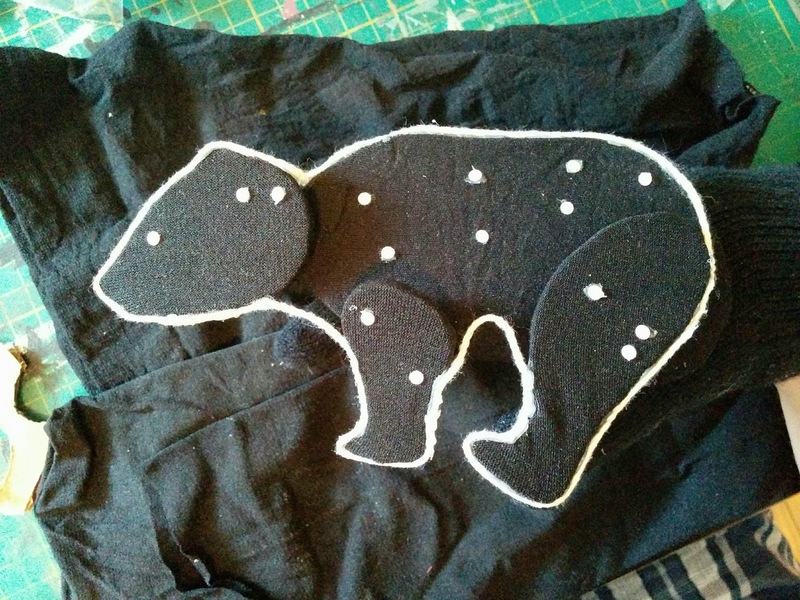 The bear constellation puppet was inspired by a Paleolithic cave painting from France. It's made of cardboard body parts, covered in material cut from a pair of black tights, then attached to a black glove worn on my right hand. 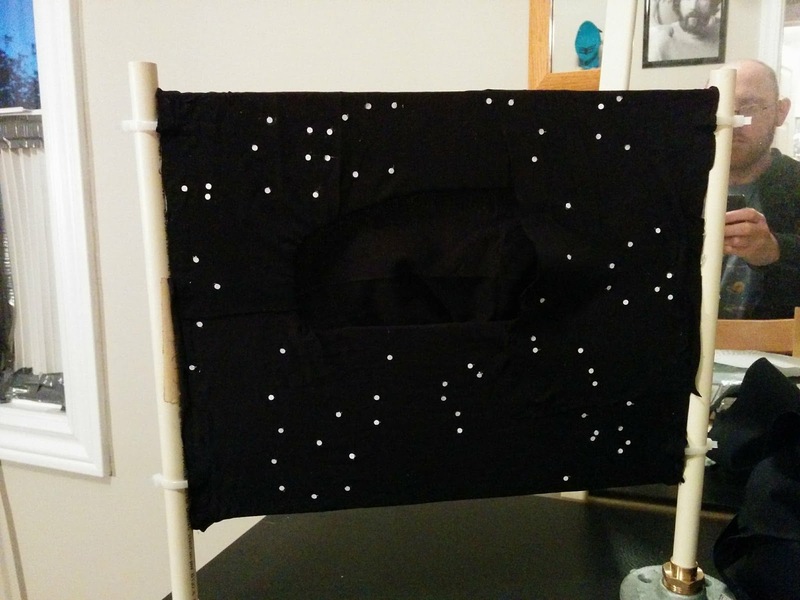 The outline is a piece of string, and the stars are punched out of paper. The stage is a piece of Plasticore, covered in more black tights and punched-paper stars. 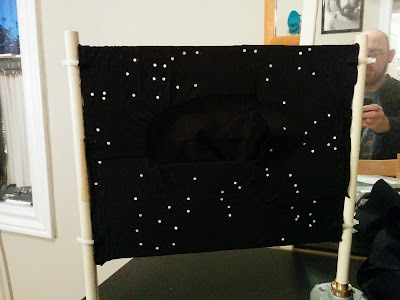 It has a hole in the middle to poke the bear through, and it's held up by PVC pipe stuck into the bases I created last year for my shadow puppet stage. Illumination was provided by a lamp mounted on the camera tripod. I fiddled with the camera's settings to crank up the contrast while at the same time deliberately underexposing. This had the effect of "crushing the blacks" -- making the subtly different shades of black all look the same so that they all blended together. Doing a performance like this allowed me to combine the best elements of live and filmed puppetry. Since I really was performing it live in front of an audience, I could respond to the music in real time, and the performance had a spontaneity that wouldn't have been there if I were just showing a prerecorded video. But since I was using a camera, with a single, fixed point of view, I could work with the lens to play with depth in a way that wouldn't normally be possible on stage. 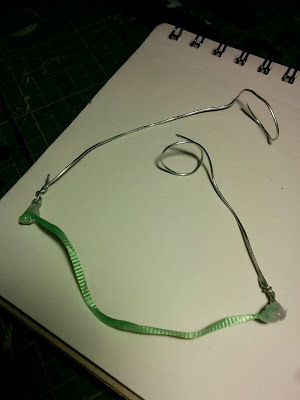 The northern lights themselves were created with the device shown above: the two pieces of wire looped around two of the fingers of my left hand, and the green ribbon, held so close to the lens that it was out of focus, formed the aurora. If you're a musician, and you'd like to hire me to create live visuals for your next concert, send me an email!